An ally treaty with bacteria — A conversation with Dr. Alex Rodrigo. Bacteria are everywhere. They have been found in the Mariana Trench and in manned spacecraft, and each one of us has several hundreds of species living in our body. During the last few years research has shown the amazing ‘friendly’ relations that some bacteria have with humans. Some of them turned out to be harmless or even perform important roles on our skin, bowels or lungs. Many others not so much. Even with antibiotics many infections are dangerous and cause many deaths every year. We have learned to look at bacteria as the bad guys, so even for scientists it can be a challenge to come up and accept ways of using them together with human cells, as a tool to improve the way cells behave. They work with lactic bacteria, the same kind of bacteria widely used in the dairy industry, to make cheese and yoghurts. Scientist have actually found that lactic bacteria and several other families of bacteria live naturally in our intestinal tract, with complex interactions between them and the surrounding human tissues. “These are non-pathogenic bacteria, meaning that they don’t cause any disease. It is generally easy to work with them in the lab. There are also well know protocols to modify them, to genetically engineer them and make them express or produce something interesting. So they are a good choice for our goals.” If you go in a biological research lab, where cells are grown and studied with great care, and say that you have a few million bacteria that would like to meet the cells, most certainly you will be swiftly banned from entering the lab ever again. Bacteria can be the bane of a cell culture lab, and a lot of resources and efforts in the labs go towards avoiding contamination of the cells with bacteria. So why would someone want to deliberately put bacteria and mammalian cells together? Is there anything the bacteria make that cells will like? “Our initial concept was to have what we call a ‘living biointerface’ between mammalian cells and the synthetic materials where cells are usually cultured and studied in the lab. When cells are in living tissues, in a human bone or heart for instance, they are always surrounded by proteins and other molecules that are like a gel or dough that keeps them together in a tri-dimensional world. 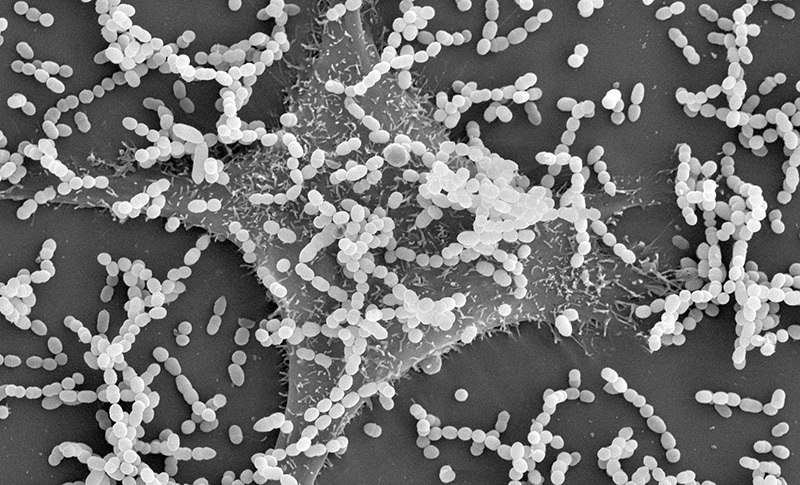 This matrix is usually non-existent or very weak when cells are cultured in the lab in the classical way, because we typically use wells with flat surfaces to grow them and only add media (what they eat and need to survive) but not the matrix they use to ‘feel’ their surroundings.” Prof Salmerón-Sanchez had the idea that bacteria could be used to produce fibronectin, one important protein of this matrix or complex mesh of structural and adhesive proteins which serve as mechanical support and that cells have around them in a living tissue. Back to the central goal of the project, the bacteria are meant to produce a fragment of a protein that can be used to control how mammalian cells behave. 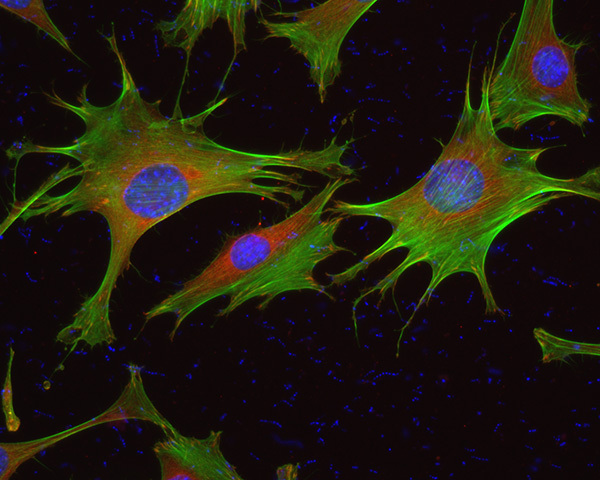 It is quite surprising that only a fragment of this protein, one between the several proteins that make up a living extracellular matrix, would have such an impact on cells. “The III7−10 fragment of the human fibronectin contains two important sequences, RGD and PHSRN. RGD is an adhesive sequence, an important part of the protein that the cells use basically to move and get information about what to do next. 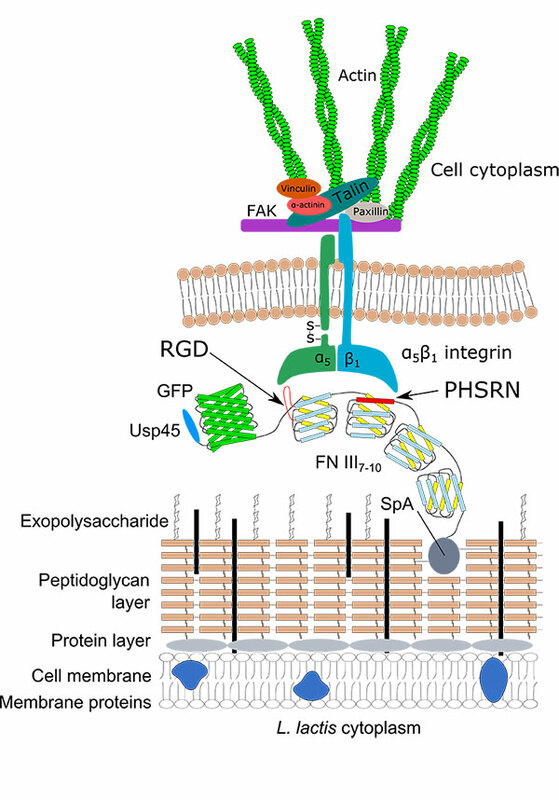 RGD interacts with a wide range of integrins, receptors in the membrane of the cells that work as ‘senses’ for the cell and allow them to transmit signals from the outside to the inside of the cell where their machinery is. The other sequence, PHSRN, increases the specificity of the interaction of the RGD sequence with some particular integrins, such as α5β1 and others. This means that both sequences together play an important role in critical cellular processes such as adhesion, migration, proliferation and differentiation,” explains Alex. Overall the system looks like a promising new tool to study cell behaviour on surfaces. But, as with everything related to scientific progress and biology, many would like to know if this work could be used to design new health applications, treatments, or helping solve other biomedical challenges. Is there any work in that direction? Bacteria have been our sworn enemies since they were linked to disease about 150 years ago. We have now found out that we require their presence in some parts of our body for a normal function, and during the next few decades we could find out that they can be very powerful allies in unexpected ways. Good luck with your work Alex!